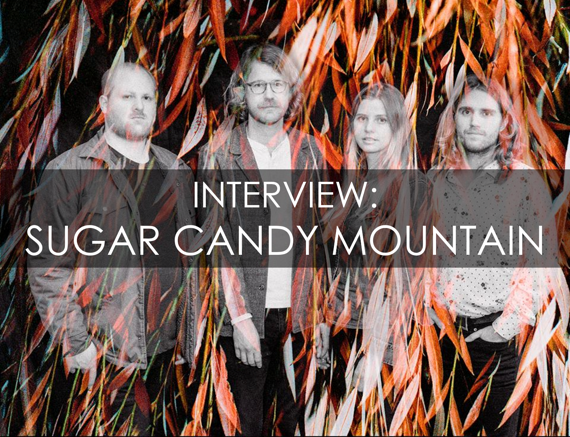 Your resource for all things shoegaze and dream pop: INTERVIEW: Sugar Candy Mountain. 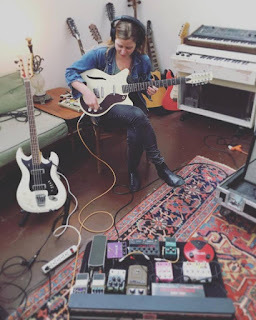 Formed in Oakland, California and recently relocated to Los Angeles, Sugar Candy Mountain centers on the songwriting collaboration of drummer Will Halsey and guitarist Ash Reiter, who share vocal duties. Completing the live lineup are Sam Faw on bass and Peter Maffei on keys and second guitar. The project’s self-titled debut came out in 2011 and is still available digitally and on cassette. Sugar Candy Mountain is an offering of fanciful, lighthearted indie pop that lets Beatles, Beach Boys, and other vintage influences shine forth unabashedly through a set of tracks that nonetheless shimmer with their own consistent, keyboard-centric sound—lush while lo-fi, with delicious synth effects accenting and bridging the songs. 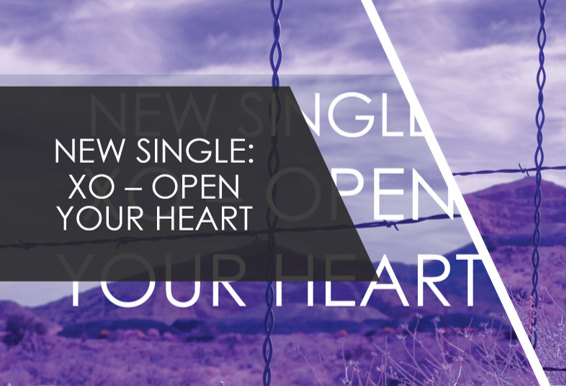 On this first outing Will and Ash’s considerable gifts for pop craft are already in full evidence, bestowing every single one of fourteen tracks with tuneful melodies that glisten effortlessly across balanced pop structures. Side Two pleasantly surprises by busting out with several drum unit-enabled dance grooves. The follow-up, Mystic Hits, came out on cassette, vinyl, and CD (as well as digitally) from Royal Oakie in 2013. The production values are somewhat higher, with an effervescent overall sound and feel likely to please fans of Tame Impala. Trippy sonic excursions and apt but unanticipated contrasts punctuate songs that flow one into the next in a way that suggests larger narrative structures, making Mystic Hits something of a progressive pop odyssey without at all weighing down its sparkle and lightness of step. With 2016 full-length 666—also available across the full range of formats—Sugar Candy Mountain’s sound shifts somewhat, crystallizing beautifully with a distinct new signature. Guitar for the first time becomes consistently more prominent in the overall sound than keyboards, and Ash’s vocal performances become front and center as she takes lead duties on all but one or two tracks and as instrumental junkets are trimmed back. Sonic atmospheres resembling those of Broadcast are here pressed a bit more tightly into service of pop structures than was generally the case with Broadcast itself—much like what Melody Prochet and Tame Impala’s Kevin Parker achieved on 2012’s self-titled release as Melody’s Echo Chamber (a project we’re still holding out hope of hearing more from). 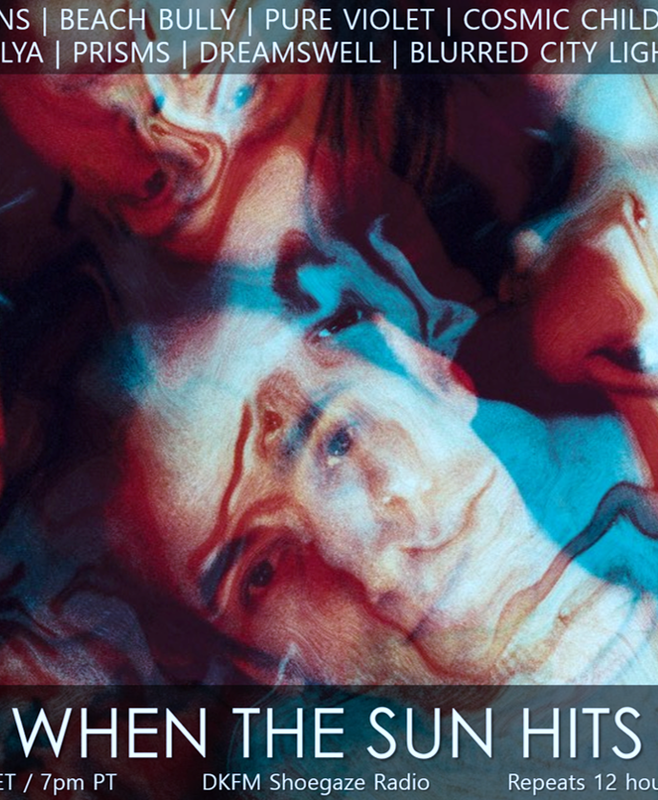 The result is an utterly beguiling album of glittering dream pop. 3000 miles or more, well, I like to keep my space. 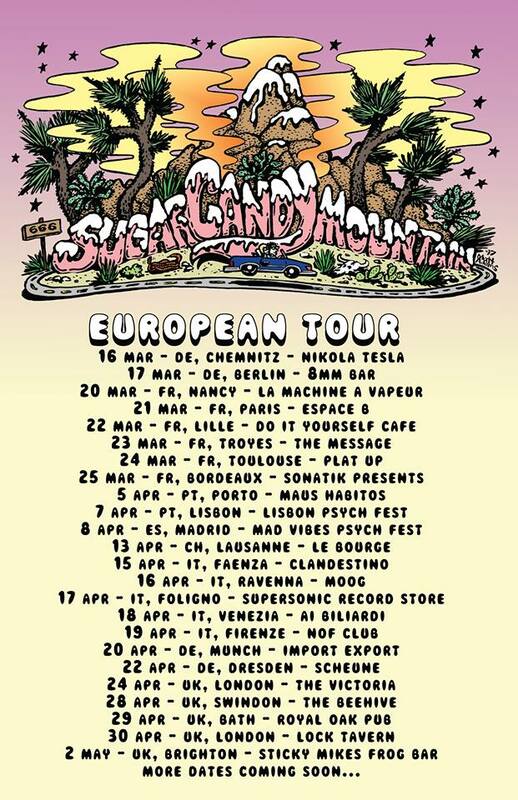 Sugar Candy Mountain’s 2017 European Tour commences as of this posting (dates below). We at WTSH wish Will and Ash and their bandmates great success and deeply appreciate the patience and availabiltiy required of them in the crafting of this interview. Will: We just tracked about half of our next album at Palmetto Recording Studio with Jason Quever of Papercuts. We had a lot of fun and are comfortable working with Jason as he recorded and played on most of 666. We'll continue recording and go on a West Coast Tour with Kikagaku Moyo after our European tour. Ash: We are also hosting our fifth annual music festival, Hickey Fest, June 16th-18th. Hickey Fest is a three-day independent music festival featuring twenty-five bands, community campgrounds, psychedelic projections and other relaxing adventures held in Leggett, California in Mendocino County, just three hours north of the Bay Area. It's named after Standish Hickey State Park, where the South Fork of the Eel River shimmers against a backdrop of majestic redwoods. Shannon and The Clams, Boogarins, and Mr. Elevator & The Brain Hotel are a few of the bands confirmed to play this year's festival. Ash: I feel it's better to identify with a region and group of musicians and bands. We are a California band. If you look at the past line ups of Hickey Fest, that's our tribe. Our fellow musician friends and influences include: Kacey Johansing, The Blank Tapes, fpod bpod, Assateague, Indianna Hale, The Range of Light Wilderness, Papercuts, Sparrows Gate, Dreamphases, Annie Girl and The Flight, Everyone Is Dirty, Vetiver, Psychic Jiu Jitsu, The Electric Magpie, Flaural, Magic Leaves, Big Search and surely twenty more that I will feel terrible later for forgetting. These are our friends and who we make a point to go out and see each week and support. That is the only genre I need. Ash: I don't have too much patience for the really jammy or super repetitive driving stuff. However there are a lot favorites who fit the bill: Holy Wave, Chris Cohen, King Gizzard and the Lizard Wizard, Flaural, Rotten Mangos, The Electric Magpie and Connan Mockasin. Ash: I really love my 1963 Gretsch Corvette. With its broken pick guard and little scratches and imperfections it fits me perfectly. Will: Ash has an awesome pedal board. When we are producing our songs I can always find a cool new sound. I love my drum kit too. I recently got an old Slingerland kit from Revival Music Shop in Portland. Ash: I'm not making music to be part of an industry. All that stuff is secondary to writing, producing, performing and recording. There are still great bands and there always will be no matter what's happening with the industry. Will: Being part of a label can be cool if the label establishes a distinct aesthetic and stamp of quality with its artist roster. Ash: Vinyl of course feels the most magical but I often find myself streaming music because I really want to hear a specific song or album. This summer I was able to listen to the new Mild High Club single from the peak of a mountain overlooking Big Bear Lake—I couldn't have done that on vinyl. Will: All the formats you mentioned are useful and have their charms. We also listen to a lot of Reverberation Radio. It's a weekly podcast from the guys in Allah-Las. It feels like old fashioned radio in a way because the music is coming to you from DJs you trust unlike a lot of commercial radio today. Ash: I learned to sing and express myself listening to Billie Holiday, Mirah, Jolie Holland and my good friend Indianna Hale; I learned to push the limits of creativity and production from The Beatles and Os Mutantes; and I learned how to perform watching the candid ease of The Blow and Chuck Prophet. I still need to learn to dance. Ash: I get a lot from reading—it always helps inspire me to write. Authors I find myself returning to again and again are the novelists Haruki Murakami, Octavia Butler and Margaret Atwood; and the poets Lyn Hejinian and Charles Baudelaire. Will: We love the art of Jess Willa Wheaton, an old high school friend of Ash's whose wedding we just attended in Manhattan's Marble Cemetery. We used her artwork for Mystic Hits, 666 and a limited release 7-inch single with our cover of The Zombies' "Beechwood Park". We plan to continue working with her for future releases. Will: We write a lot outdoors or during our travels. There are places by the Russian River and Crockett, California that have been particularly inspiring. "Time", "Tired" and "Windows" were written in Italy. Just a heads up, the chorus on "Being" is actually a reference to one of the authors Ash mentions, Octavia Butler. It's a direct quote from the Parable series!